Before there was a modern hospital in Athens, a married couple opened their home to women who were pregnant and about to give birth. Later they turned their home into a makeshift hospital. The Sheltering Arms Hospital, 19 Clarke St., was once a lying-in ward for women of the surrounding area who had recently given birth and the home of Charles and Delia Breinig. The hospital opened in 1921 and originally had only two rooms for its patients. The home-based hospital grew over time, adding more rooms to the original house. In 1970, the Sheltering Arms closed its doors and became what is now OhioHealth O'Bleness Hospital. The building still stands and is now low-income housing apartments for senior citizens subsidized by the federal government’s Department of Housing and Urban Development. Before the Sheltering Arms Hospital became a small hospital, it was a lying-in facility that undertook women recovering from childbirth. “Generally speaking, prenatal care was not established as a norm at that point. There were some forward-thinking people and doctors talking about it but it was definitely not the norm,” Patty Stokes, an assistant professor of women’s and gender studies at Ohio University, said. The residents of Athens and the surrounding areas were lucky in a way to have a place to go to give birth and recover. In most cases, towns similar to Athens had a midwife who would help women give birth at home. Midwives, though helpful, were far less qualified than doctors. Giving birth in a hospital was somewhat rare at the time, Stokes said. “That’s a point where in this country and pretty much every country hospital delivery is not yet universal, but at that point it was heading pretty fast at becoming that,” Stokes said. In the early 1920s, when the Sheltering Arms was just opening, poor women, mostly in urban areas, tended to go to hospitals to give birth because they could not get care any other way, Stokes said. Most women of means would start to consider giving birth in a hospital rather than at home because of safer conditions. Doctors John Sprague and Blaine Goldsberry convinced the Breinigs, after dedicating their house to be a lying-in facility, to expand. They added a four-room addition to the house. The Breinigs then moved next door while Delia continued to work as a cook, laundress, nurse and whatever else was needed, according to Getting to Know Athens County by Elizabeth Grover Beatty and Marjorie Stone. 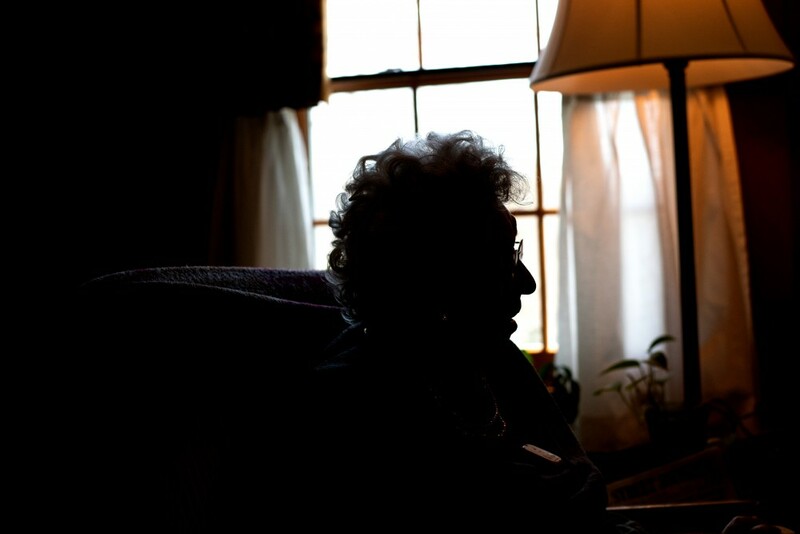 When Stone moved to Athens in 1956, the Sheltering Arms was still operating through a house. 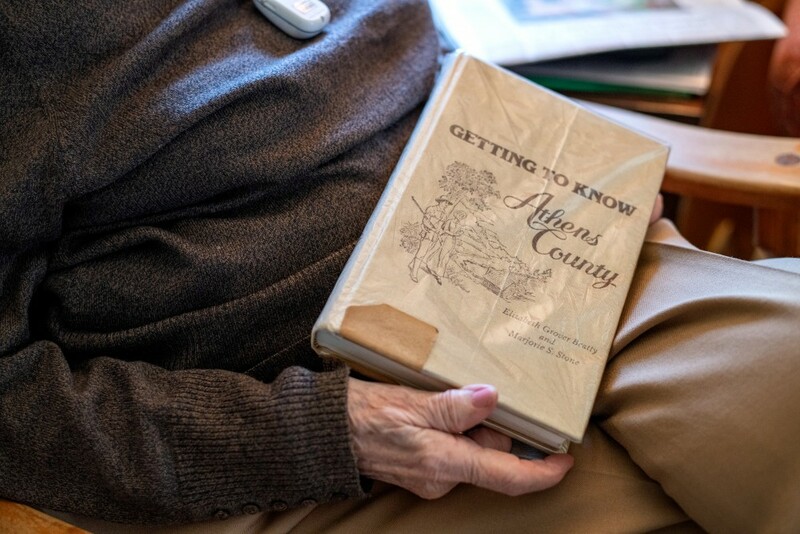 Marjorie Stone holds a copy of Getting to Know Athens County, written by herself and Elizabeth Beatty. “It was like a rural hospital run by volunteer doctors in what once had been a home,” Stone said. In her book, Stone described the hospital as a desire the residents of Athens had for a long time. The building had 24 beds and new services were added. Residents no longer had to go out of town for medical treatment. “(The Breinigs) set up a bedroom and then slowly, they enlarged it because the doctors said if you can have people there for giving birth, you could have them there if they were sick and needing attention,” Stone said. The hospital was a godsend, Stone said. It was not adequate in terms of what a hospital should be, but it was still valued by the residents. “It served us well,” Stone said. Tom O’Grady, the executive director of the Southeast Ohio Historical Center, said the facility became the one of the only places people could go for medical care. “It became the center for medical treatment for Athens. I don’t know what other options there were that early on,” O’Grady said. Most people had to travel to either Columbus or Parkersburg, West Virginia, for medical care before the Sheltering Arms opened up, according to Getting to Know Athens County. Alan Goldsberry, an Athens resident and retired judge, was born in the Sheltering Arms in 1944. His cousin, Blaine Goldsberry, was one of the doctors that helped form the hospital. Alan, other than being born at the hospital, was treated there when he was a child. He was riding on a friend’s bike and fell off, cutting open his chin. Towards the end of the Sheltering Arms Hospital’s standing on 19 Clarke St., the facility became outdated. Skip Young worked at the facility during the last year before moving to O’Bleness Memorial Hospital. He moved to Athens in 1969 to help set up the radiology and cardiology departments and worked at the hospital for at least 42 years. The medical needs of residents had outgrown the home-turned hospital and Charles O’Bleness, a local banker, donated the majority of the funding for a new hospital. He donated one million dollars of the 1.7 million dollars it took to build the new hospital. Archive photo from the Athens Messenger collected by Marjorie Stone. Once O’Bleness donated the money, the rest of the donations came from Athens residents. In 1967, construction started. 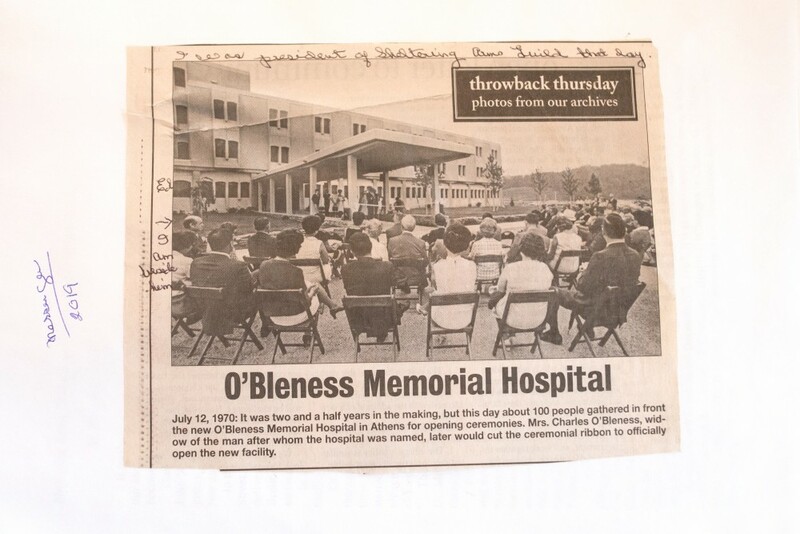 When O’Bleness died in 1969, it was decided the hospital would be named after him. Once O’Bleness Memorial Hospital opened in 1970, Young said it was like night and day. Despite the Sheltering Arms being antiquated towards the end, Young believed the makeshift hospital was still a blessing for people living in and around Athens. “It probably was a kind of a godsend for the ladies that were delivering babies,” Young said. Still, the residents of Athens were happy with the construction of the new hospital, Stone said. 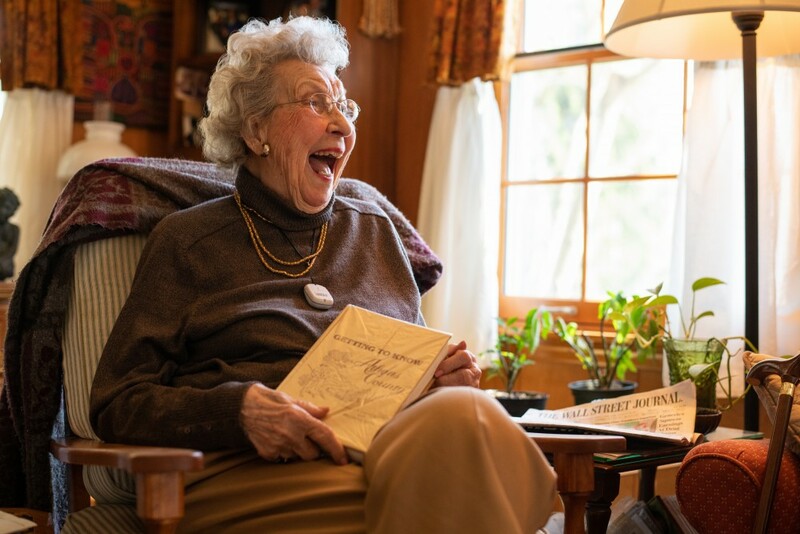 Marjorie Stone in her home in Athens, Ohio, on Wednesday, April 3, 2019. Even with the expansion of the original Sheltering Arms Hospital and cleaner medical practices, sometimes things happen at the new hospital that can only happen in Appalachia. Stokes had her second child, Leo, at what is now named OhioHealth O’Bleness Hospital. It was a busy day for the hospital because there were four or five babies being born, not the usual one or two a day. When she asked for an epidural, the person administering it had come into the room and brought along the smell of a skunk. His dog had been tangled up with a skunk before he came in for his shift, Stokes said. Stokes and her husband said they truly felt like they were in Appalachia at that point. A previous version of this article incorrectly named Marjorie Stone. The article has been updated to reflect the most accurate information.